Evolving industrial technology-driven by the need to increase safety while reducing production losses-along with environmental factors and legal concerns has resulted in an increased emphasis on sound troubleshooting techniques and documentation. 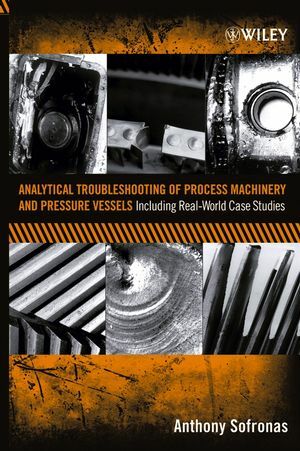 Analytical Troubleshooting of Process Machinery and Pressure Vessels provides both students and engineering professionals with the tools necessary for understanding and solving equipment problems in today's complex processing environment. Drawing on forty years of industrial experience in the petrochemical, transportation, and component manufacturing industries, the author introduces analytical models that utilize simple mathematics to provide engineers with the information needed to understand equipment operation and failure modes. This will allow engineering professionals to talk intelligibly with manufacturers, implement modifications required for continued operation, and ultimately help them save millions of dollars in lost production or warranty claims. By striking a balance between analytical and practical considerations, each potential problem area is illustrated with case studies taken from the author's own extensive experience and accompanied by methods that can be used to address a variety of related challenges. ANTHONY SOFRONAS, DEng, PE, has spent the past forty years troubleshooting field failures and designing machinery and fixed equipment for ExxonMobil, Bendix, and General Electric. He is currently a consultant to industry and presents seminars worldwide through his company Engineered Products. He has published forty-one technical papers and articles, along with a bimonthly column for Hydrocarbon Processing magazine on engineering case histories. 2.2.7 Transient Temperatures and Stresses. 2.3 Piping Thermal Forces, Moments, Frequencies. 2.4 Allowable and Design Stresses. 2.5 Fatigue Due to Cyclic Loading. 2.6 Elongation and Deflection Calculations. 2.8 Case History: Agitator Bearing Loading. 2.9 Case History: Shaft Failure. 2.11 Case History: Centrifuge Bearing Failures. 2.12 Case History: Bird Impact Force on a Windscreen. 2.13 Case History: Torsional Impact on a Propeller. 2.14 Case History: Start-up Torque on a Motor Coupling. 2.15 Case History: Frictional Clamping Due to Bolting. 2.16 Case History: Failure of a Connecting Rod in a Race Car. 2.17.3 Bolt Elongation and Relaxation. 2.17.6 Stripping Strength of Threads. 2.17.7 Case History: A Power Head Gasket Leak. 2.18 Ball and Roller Bearing Life Estimates. 2.18.1 Case History: Bearing Life of a Shaft Support. 2.18.2 Coupling Offset and Bearing Life. 2.19.1 Shell and Pad Failures. 2.20.2 Case History: Up-Rate Acceptability of a Gear Unit. 2.21.1 Keyless Hydraulically Fitted Hubs. 2.21.2 Case History: Taper Fit Holding Ability. 2.21.3 Case History: The Flying Hydraulically Fitted Hub. 2.24.4 Sleeve bearings and Bushing Clearances. 2.24.6 Acceptable Coupling Offset and Angular Misalignment. 2.25.1 Failures with Axial, Bending and Torsional Loading. 2.25.7 Large Gearbox Keyway / Shaft Failures. 2.26 Case History: Sizing a Bushing Running Clearance. 2.27 Case History: Galling of a Shaft In A Bushing. 2.28 Case History: Remaining Fatigue Life with Cyclic Stresses. 2.29 A Procedure for Evaluating Gasket Joints. 2.30 Gaskets In High Temperature Service. 2.32 Case History: Gasket Won't Pass Hydrotest. 2.33 Case History: Heat Exchanger Leak Due to Temperature. 2.35 Case History: Excessive Wear of a Ball Valve. 3.1 Spring /Mass Systems and Resonance. 3.2 Case History: Critical Speed Problem on Steam Turbine. 3.3.1 Allowable Levels for X or F at Resonance . 3.4 Case History: Vibratory Torque on Gear of a Ship System. 3.6 Case History: Torsional Vibration of Motor-Generator-Blower. 3.7 Vibration Diagnosis and Campbell Diagrams. 3.8 Case History: The Effect of a Suddenly Applied Torsional Load. 3.10 Case History: Heat Exchanger Tube Vibration. 3.11 Case History: Piping Vibration Failures. 4.4 Forces Due to Fluids. 4.5 Case History: A Piping Failure Due to Water Hammer. 4.6 Case History: A Centrifugal Pump System. 4.6.3 Net Positive Suction Head NPSH. 4.6.5 Series and Parallel Pump Operation. 4.6.6 Blocked In Pump Concern. 4.7 Case History: Wreck of a Centrifugal Pump. 4.8 Case History: Airfoil Aerodynamic Loads. 4.9 Case History: Pressure Loss Through Slots. 4.10 Friction Losses in Piping Systems. 4.11 Case History: Pipe Friction. 5.5 Case History: Insulation Burn-Out of a Resistor Bank. 5.6 Case History: Embedded Bearing Temperature. 5.7 Types of Heat Exchangers. 5.9 Case History: Verifying the Size of an Oil Cooler. 5.10 Case History: Temperature Distribution Along a Flare Line. 5.11 Case History: Derivation of a Pipe Temperature Distribution. 6. Compressor Systems and Thermodynamics. 6.2 Case History: Non - Relieving Explosion Relief Valve. 6.4 Case History: Air Conditioner Feasibility Study. 6.7 Centrifugal Compressor Head, Flow and Horsepower. 6.10 Flow - Head Curve Troubleshooting. 6.12 Component Failures and Prevention. 6.13 Reciprocating Compressor Horsepower Calculations. 6.14 Troubleshooting Reciprocating Compressors Using Gas Calculations. 6.16 Flexible Gear, Diaphragm and Disc Pack Couplings. 7.1 Average, Range, Variance, Standard Deviation. 7.2 Histograms and Normal Distributions. 7.3 Case History: Power Cylinder Life Comparison. 7.4 Mean Time Between Failures. 7.5 Case History: MTBF for a Gas Engine Compressor. 7.7 Deterministic and Probabilistic Modeling. 8. Problem Solving and Decision Making. 8.2 Going Through the Data. 8.3 A Problem Solving Technique. 8.4 Case History: Loss of a Slurry Pump. 8.5 Case History: The Fatigued Motor Shaft. 8.6 Case History: Coupling Failure. 8.7 Case History: Motorcycle Won't Start. 8.8 Case History: Galled Die. 8.10 A Decision Making Technique. 8.11 Case History: Selection of a Barrel Lifter. 9.2 High Strength Low Alloy Steels. 9.10 All Steels Are Not The Same. 9.13 Failure Modes of Shafts, Bolting, Structures and Vessels. 10. Mechanical System Modeling with Case Histories. 10.1 Sizing Up the Problem. 10.3 Failures Caused by Excessive Loads:. 10.3.1 Case History: An Agitator Bolt Failure. 10.3.2 Case History: Loosening of Counterweight Bolt. 10.3.3 Case History: Evaluating Internal Thread Strip - Out. 10.3.4 Case History: Analyzing a Spline Failure. 10.3.5 Case History: The Bending of Impeller Blades . 10.3.6 Case History: A Compressor Rod Failure. 10.3.7 Case History: Seal Failure Due to Misalignment of an Agitator Shaft. 10.3.8 Case History: Gear Tooth Pitting Failure. 10.3.9 Case History: Impact Load Effect on a Large Gearbox Bearing. 10.3.10 Case History: A Motor Shaft Failure . 10.3.11 Case History: An In-Flight Aircraft Crankshaft Failure. 10.3.12 Case History: A Pitting Failure Due to a Poorly Distributed Bearing Load. 10.3.13 Case History: Failure of a Pre-loaded Fan Bearings. 10.3.14 Case History: The Separating Loads in an Extruder. 10.3.15 Case History: Containment of an Impeller. 10.4 Failures Caused by Wear:. 10.4.1 Case History: Examining the Wear of Extruder Screws. 10.4.2 Case History: Wear of a Spline Clutch. 10.5 Failures Caused by Thermal Loads:. 10.5.1 Case History: Thermal Distortions Move a 50 Ton Gearbox. 10.5.2 Case History: The Thermally Bowed Shaft. 10.5.3 Case History: A Steam Turbine Diaphragm Failure. 10.5.4 Case History: Screw Compressor Rotor Rub . 10.5.5 Case History: The Hidden Load in a Three Bearing Machine. 10.6.1 Case History: Crack Growth in a Rotor. 10.6.2 Case History: Structural Failure Due to Misalignment. 10.6.3 Case History: Oil Film Thickness of a Diesel Engine Bearing. 10.6.4 Case History: The Leaking Flange Gasket. 11. Fitness For Service with Case Histories. 11.1 A Little About Corrosion. 11.3.1 Case History: Local Corrosion of a Vessel Wall. 11.4.1 Case History: Pitting Corrosion of a Vessel Wall. 11.5.1 Academic Example: Temperature Effect on a Steel Plate. 11.5.2 Case History: Crack Like Defect in a Vessel Wall. 11.6.1 Case History: Cold Service Vessel. 11.7 Crack Growth and Fatigue Life. 11.9 Troubleshooting Isn't So Easy.